MV Baltic Trader successfully completed offloading at about 6pm on Sunday 12th November 2017. 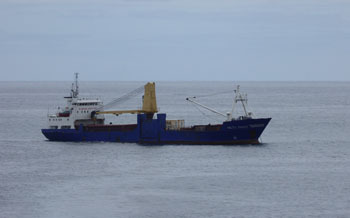 The lobster product was back loaded the following morning and the only passenger, Bernard Pronost, went on board at 12.00am. The ship sailed for Cape Town at 1.30pm. MV Baltic Trader departed Cape Town on the morning of Saturday 28th October 2017 and arrived at Tristan at about noon on Monday 6th November. The only passenger on board was visitor Bernard Pronost. He came ashore during the afternoon on a raft, together with two bulls imported to improve local cattle stock. This voyage is principally to transport materials to Tristan for dolos moulding, Puma road project and other planned works over the next few months. This additional sailing of the Baltic Trader, the second of 2017, means that there will be three Ovenstone vessels arriving during November, with MFV Edinburgh expected to depart Cape Town on 7th November and MFV Geo Searcher on 15th November. See the latest updated shipping schedule for details.